MITZPE RAMON, ISRAEL–The last location Wooster Geologists in Israel visited today was on the southern edge of the Makhtesh Ramon structure (N 30.58209°, E 34.89375°). Here are excellent exposures of the Ora Formation (Upper Cretaceous, Turonian). This curious feature was a challenge to the students to interpret. I also got it wrong in my explanation on the outcrop, so listen up Steph, Lizzie and Oscar! 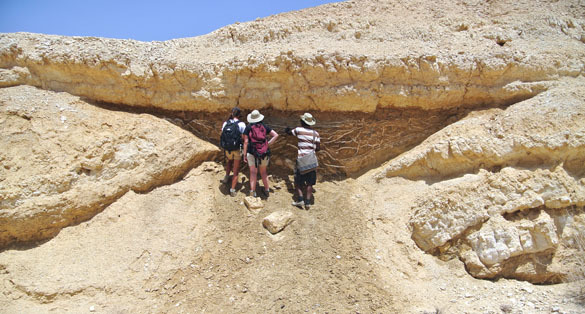 The students are standing in a portion of the outcrop that is mud with suspended blocks of limestone. This is a cross-section of a diapir, or body of sediment that has moved upwards through the rocks that cap it. This was caused by water-saturated sediment being compressed by the sediments above, forcing it upwards through cracks and crevices. What I got wrong was that the flat strata on top of the mud was present when the diapir formed. (I said it came later.) The mud never reached the surface to become a mud volcano. This is why the resistant beds below are bent downwards — the upward force of the mud flow was stopped by the capping rock, thus deflecting the edges of the units below. A complicated story — which is one of the many things that makes the Ora Formation interesting. 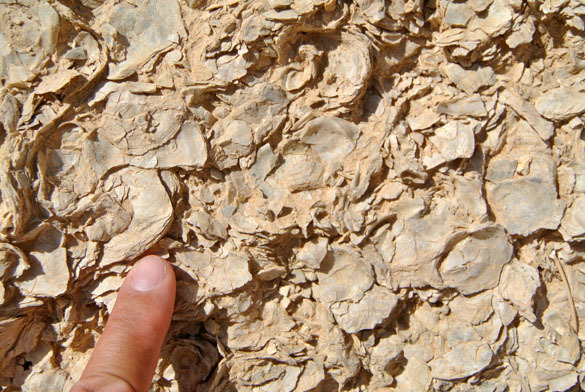 The Ora Formation also has a fabulous carbonate hardground, which was a cemented seafloor surface. We can tell this particular surface was hard rock on the Cretaceous seafloor because of all those little holes. These are the borings of bivalves known as Gastrochaenolites. They could only be made by grinding away at a cemented substrate. Hardgrounds, oysters, odd diapirs … opportunities for future study! Israeli geologists have done fantastic work with this unit, so there are many collaborations possible here.